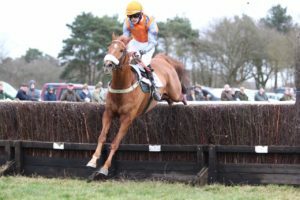 Start Royal completed the surely unparalleled feat of winning at least one race for twelve consecutive years when landing the Skinner’s Pet Foods Ladies Open at a chilly North Norfolk Harriers Point-To-Point at Higham, between Ipswich and Colchester, on Sunday. Now 15 years of age, Start Royal has been owned throughout his astonishingly consistent racing career by Stuart and Hilda Nash and Michael Avery and trained at Aston Rowant in Oxfordshire by Alan Hill, who deserves maximum respect for maintaining his health and enthusiasm for such an extended period – especially given that Alan himself rides him out every morning. Start Royal may no longer have quite the class and speed that he showed in his pomp, but, in the hands of jockey Izzie Marshall, he showed great tenacity to hold off Sand Blast and Sa Kaldoun in a race in which the entire field of three was covered by just two and a half lengths at the finish. Start Royal made every yard of the running and the same trail-blazing tactics were also successfully employed by another Hill stable stalwart, Broken Eagle, in the Mens Open Race. Ridden by Archie Wright, from Badlingham, near Newmarket, Broken Eagle did not always jump with his usual alacrity but he stretched clear of his two opponents with a mile to race and eventually came home with four lengths to spare from Steeles Terrace. 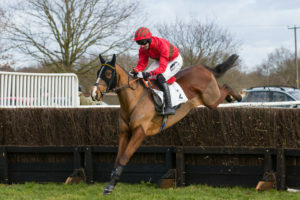 “We were never going faster than over the final three fences and I didn’t have a moment’s worry through the entire race,” said Wright, who went on to complete a riding double when guiding Butredgipandgump, who is trained by his father, Nick, to an exciting triumph in the closing Countryside Alliance Conditions Race. 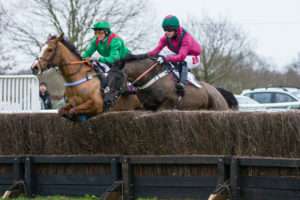 This six-runner affair was bossed by Poyle Thomas until he was joined by Butredgipandgump at the fourth last obstacle. 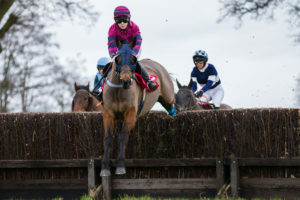 The pair had a great battle over the next half mile and, although Poyle Thomas seemed to have got the better of their duel when moving into a one length lead crossing the final fence, Burtredgipandgump rallied in the last 100 yards to score by half a length. 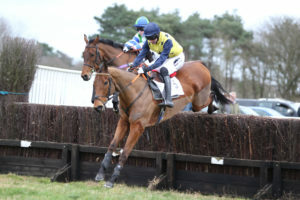 Trainer Andrew Pennock, from Timworth, near Bury St Edmunds, and jockey Dickie Collinson, from Sutton, near Ely, followed up their double strike at Ampton a fortnight earlier with another brace of victories, this time courtesy of Bullsempire in the Maiden Race and Somme Boy in the Restricted Race. The Maiden was an action-packed contest, with all four runners still in with a chance as they took off at the 18th of their 19 fences. It was here that both Flaggan and Uknowwhatimean crashed to the deck, leaving the hot favourite, Josh The Plod, to fight out the finish with Bullsempire. 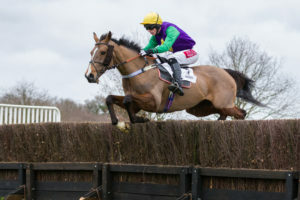 A serious mistake at the last fence seemed to have scuppered the hopes of Bullsempire, especially since Collinson lost one of his stirrups in maintaining the partnership. Yet, with Josh The Plod flagging, Bullsempire conjured a final thrust that saw him cross the line three-quarters of a length in front. The same obstacle also played a pivotal part in the Restricted as a bad jumping error there by Captiva Island allowed his solitary rival, Somme Boy, to grab an advantage he was never to relinquish. This was a particularly sweet result for Pennock’s wife, Ruth, as Somme Boy is a firm favourite of hers and is such a sweet-natured horse that he is sometimes ridden by the couple’s seven-year-old son, Henry. The smoothest success of the afternoon came in the Novice Riders Race as One Fine Morning benefitted from a fine ride from 23-year-old Charlie Clover, from Shimpling, near Bury St Edmunds, to defeat Abbey Lane by ten lengths. Finally, the outstanding work of this meeting’s secretary, Tina Hayward, from Heydon, near Norwich, merits public recognition. Tina was presented with a painting to mark her 40 years of service and it is fervently hoped that she will continue to fill the role for some time to come. Here are the full results for the North Norfolk Harriers meeting held at Higham. The official going was good, good to firm in places.